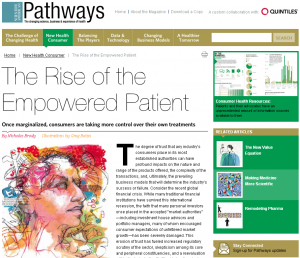 The business of patient engagement: should consumers be regulated? I edited the top portion at 8:14 pm ET, a few minutes after posting, adding the “key difference” paragraph. Sunday morning, added the Klick Pharma item under Income. Will industry be required to publicly list monies used for sponsorship, travel and swag support of high profile patients in the social sphere? Should high visibility patients who serve as stewards and advocates disavow themselves of contact with pharma just as many academic medical centers have begun? As is often the case, I don’t have an answer. I’m just raising the questions. Fine with me if industry discloses those payments. Nothing to hide. Otoh, I think it’s nuts and counterproductive for consumers in any industry to disconnect. Academic medical centers have tons of evidence of influence corrupting the academic processes that are at the core of (supposed) science. For patient advocates I don’t see that there’s currently a problem that would justify adding regulators, the ensuing budget impact, etc. Besides, there’s a key difference: academics are supposed to vet industry. It’s their job in this context. Patients, on the other hand, are the consumers – the ones the industry’s supposed to serve. As @Doctor_V suggests, healthcare is changing now that industry recognizes patients are worth engaging with. (I presume I’m one of his “high visibility” patients.) And this turned out to be the right time for some thoughts I’ve been meaning to express about my own work. 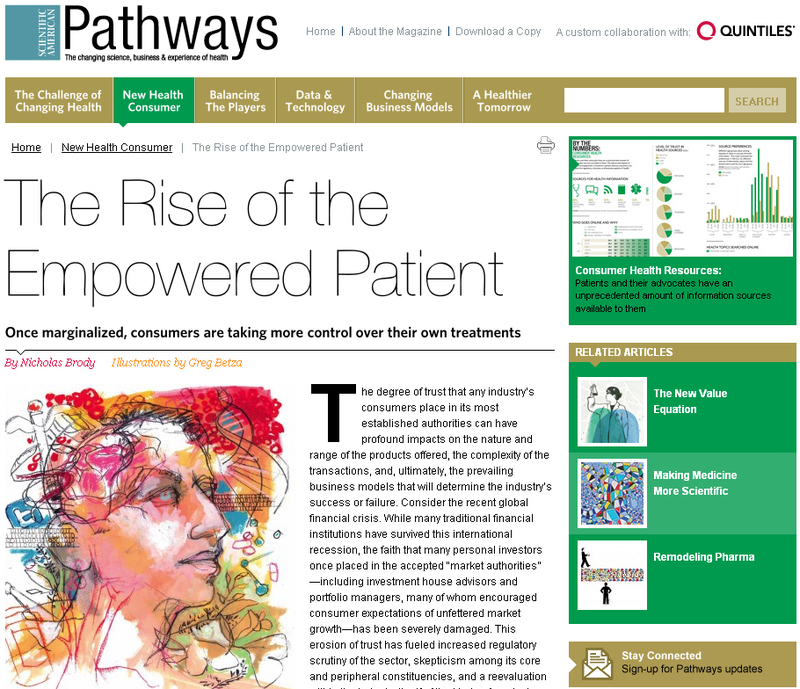 Pathways, a Scientific American magazine, has a long new article, The Rise of the Empowered Patient. Fittingly, I’m just starting a full day meeting of the new Proleukin Patient Advisory Board in San Diego, so I haven’t read the article yet. More later. I think e-Patient Connections is the highest value business conference for how patient engagement can transform healthcare. Conceived by former pharma marketer Kevin Kruse, last year it attracted a hybrid audience: almost half of attendees were in public health and non-pharma sectors. All came to understand connecting with empowered, engaged patients. It was a high quality event, with smooth logistics and facilities, despite being its first year with a skeleton staff. This year I’m speaking in the opening keynote on 9/28, and I gladly agreed to participate in this new video. I want to say why. As regular readers know (here and on my personal blog and e-patients.net), I think healthcare transformation is both a need and an opportunity. We desperately need to stop the cost spiral, we need to much more effectively connect clinicians’ skills with the patients and families who need them, and we need to improve quality and eliminate medical errors. Innovation has turned many industries inside out – why not healthcare? Because we’re missing something. When smart people work hard for a long time, unsuccessfully, it’s a good bet they’re overlooking something fundamental. I believe it’s that the engaged patient is a valuable and underutilized resource, and most businesses don’t get it. So they operate, leaving a worthy resource untouched. This resource blindness constitutes waste. E-Patient Connections 2009 taught attendees how to understand the value of connecting authentically with e-patients. I encourage people to attend. Full disclosure: I receive no fee from this conference, just travel expenses. My speech will be inside the keynote by Klick Pharma, a client who has me on a small quarterly retainer. I support this conference for exactly the reason I said – it’s a smart, valuable event, addressing a vital aspect of making healthcare more effective and more efficient. As I build my new career in healthcare, speaker fees are my main income. Here’s one I did for free. Usually when I speak, one of the first things I have to say is “Trust me, your time will come. ‘Patient’ is not a third-person word.” Well, I got to skip that part in June when I spoke to a bunch of people who already have my disease. And boy did we surpass the normal subject matter. Immense thanks to them for making this event FREE (including lunch) to all patients, and offering the video for free distribution to all who weren’t there. They say the videos of other talks will be available on their site shortly – with full credentials for the doctors, probably. :–) Thanks to them for letting me have it first! eBook experts, advice please: Best way to convert complex layouts? Update: the questions were answered (thank you all!) and the book’s now available on Kindle. Buy some now! We have many, many requests for a Kindle, eBook (Sony) or iPad version of Laugh, Sing, and Eat Like a Pig, and the time has come to git ‘er done. BUT (and it’s a big but), for this book there are decisions to be made, so it’s time to crowdsource: what’s our best approach?